Lua error in Module:Location_map at line 488: Unable to find the specified location map definition: "Module:Location map/data/Los Angeles" does not exist. Wikimedia Commons has media related to West Hollywood, California. 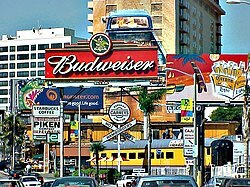 West Hollywood (nickname: WeHo) is a city of Los Angeles County, California. It was made a city on November 29, 1984. The population was 34,399 at the 2010 census. According to a 2002 analysis, 41% of the city's population is made up of gays. 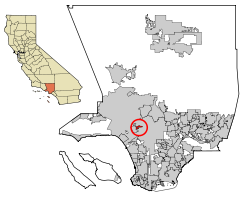 West Hollywood and the neighboring city of Beverly Hills are surrounded by the city of Los Angeles. ↑ "West Hollywood General Plan 2035 Public Review Draft". City of West Hollywood. p. 27. Retrieved April 7, 2015. ↑ 3.0 3.1 "City Council". City of West Hollywood. Retrieved March 25, 2015. ↑ "Paul Arevalo". City of West Hollywood. Retrieved December 29, 2014. ↑ "West Hollywood". Geographic Names Information System. United States Geological Survey. Retrieved October 20, 2014. ↑ "West Hollywood (city) QuickFacts". United States Census Bureau. Retrieved January 26, 2015. ↑ "West Hollywood profile: American Factfinder". Factfinder2.census.gov. 2010-10-05. Retrieved 2011-05-28. This page was last changed on 4 September 2018, at 23:09.